At Amplitude, we often use the phrase “product-led” because it represents something we are really passionate about, and it inspires why we’re building the product we are building. We acknowledge that the phrase is prone to misunderstanding. In this post, we want to explain where we’re coming from, and hopefully start a dialogue. What does it mean to be “product-led”? Let’s start with what it does not mean for us at Amplitude. It does not mean being “product manager led”. Great products emerge from empowered, fully Great products emerge from empowered, fully cross-functional teams. cross-functional teams. There’s no perfect, one-size-fits-all leadership model. So it’s not that. It does not imply some sort of hierarchy between product and X (e.g. design, or support). Everything—down to your contracts, your docs, your sales collateral, and your deployment pipeline—has some impact on how customers derive value from “the product.” So it’s not that either. Finally, it is not about products “marketing and selling themselves.” Some of the world’s best products require a high-touch, consultative sales approach. How you sell and interact with prospects is a big part of the product experience, and an area ripe for product-led innovation. Product-led means being guided by the potential of products and product teams, and breaking down the silos between “the business” and “the product”. The business IS the product. How does being product-led play out in practice? I collaborated recently with a frustrated designer trying to advocate for more access to behavioral analytics in her organization (massive scale B2C). Her organization was investing large amounts of money on acquisition. The marketing team had an army of data scientists and analysts. Marketing controlled the product roadmap. Annual reports were aglow with “the formula,” talk of big-data, and healthy up-and-to-the-right growth projections. Why? “Money in, money out!” That predictability was both reassuring, and as it turns out… a crutch. On the front-lines, the story was very different. Explained this designer: “we’re leaving massive amounts of money on the table due to the front-loaded, prescriptive, just-build-it-this-way approach! There are huge, glaring usability issues, and we have promising ideas to increase engagement!” Asymmetric payoffs were there for the taking if they could shift decision-autonomy to the front-lines, and embrace experimentation. In business-speak, she saw opportunities to increase customer LTV (lifetime value) in a big way by being more product-led. Product-led companies nail the “easy” stuff, but they are also predictable learners and Product-led companies nail the “easy” stuff”, but they are also predictable learners and value-creators. value-creators when things get messy, unpredictable, and human. Consider the standard sales funnel. We’ve had decades of competition at the tip-top of the funnel in terms of tools and practices. Innovation at this level is not uncommon, but a good chunk of success is about pure execution with known approaches. Complicated, not complex. Execution wins. But notice where the funnel ends in the standard funnels. Customers/users drop out the bottom of the funnel into The Product. This is where things get very messy—where empowered cross-functional product development teams play and win. Not to overburden the metaphor, but at Amplitude, we buy into At Amplitude, we buy into the idea of an “engagement ladder” not a funnel. the idea of an “engagement ladder” not a funnel. Each successive step of the ladder involves a complex set of engagement loops. (Dig into engagement ladders and loops in a new playbook we just published called Mastering Engagement.) 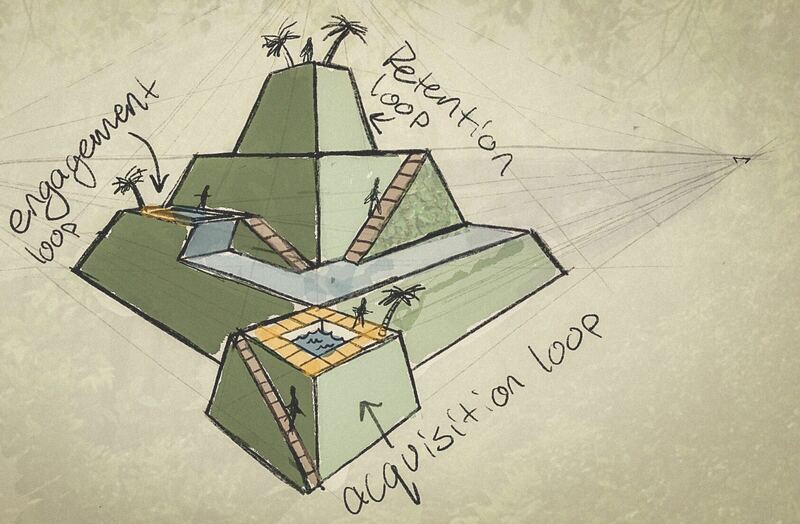 In a product-led company, teams own and influence these loops. There are always more steps to the ladder. The savviest teams go “upstream” and play in areas traditionally reserved for sales and marketing. Different product loops work best together when one loop leads to another, much like a ladder brings you to the next level. So this is our take on being product-led. It is about differentiation, learning and problem-solving, exploring step changes and seizing new opportunities, and moving teams closer to the “edge”—the users and customers. We’ve designed Amplitude to help companies and teams on this journey, and we’re excited by what the future holds. Hopefully this explains what we mean here at Amplitude when we talk about being product-led. Maybe you have other words for it. Perhaps it is too hard to decouple the idea from being product-manager led, and so you’ve opted for something else. What works for you and your organization? Or if you’re getting pushback, what doesn’t work? We’d love to hear from you. This post is part of our Product Innovator Series that explores what it takes for businesses to survive and thrive in the product-led era.